Last week two new programs joined our monitor – both of them deal with cryptocurrency investments. However, today I am going to review the first one that joined Davidnews.com monitor – a program called Coinfinance Ltd. Coinfinance Ltd joined Golden Stage listing on September 11, 2018, but it has been online for 13 days in total. I have reinvested in the program $400 and will keep you updated about the payments status. In short Coinfinance Ltd is offering to help us to take advantage of the cryptocurrency market with five mid-term investment plans. If you want to learn more about this program and its features, keep reading this review. Coinfinance Ltd is offering five investment plans from 3% up to 5% daily for 70 business days that slightly differ in terms of min and max investments. Respectively, the first plan (deposit $10, the - $999) offers 3% daily, the second plan (deposit $1000 - $9999) offers 3.5% daily, the third plan (deposit $10 000 - $49 999) – 4% daily, the fourth plan (deposit $50 000 - $99 999) – 4.5% daily and the fifth plan (deposit $100 000 - $1 000 000) - 5% daily for 70 business days. For all five plans, the initial deposit can be withdrawn at the end of the investment term. Withdrawal requests through Bitcoin, Litecoin, and DogeCoin (up to $500) are processed instantly. However, withdrawal requests for other cryptocurrencies or in an amount of more than $500 will take up to 24 hours to be processed. The minimum withdrawal is $1, but the maximum withdrawal is not set. The program accepts Bitcoin, Ethereum, Bitcoin Cash, LiteCoin, DogeCoin, and Dash. The profile of programs that I like to call “cryptocurrency inspired” have slightly changed lately. A few months ago, these programs mainly offered cryptocurrency mining. However, lately, so-called cryptocurrency inspired programs tend to offer to invest in cryptocurrency markets. This is exactly what Coinfinance Ltd is offering – to turn cryptocurrency investing into a “comfortable, speedy, easy and relatively risk-free process”. The words “risk-free”, “reduce risks” caught my attention repeatedly while I was browsing the website for the first time. Of course, it's definitely not accidentally. For example, in the FAQ page, the following question is answered: “Are there risks to lose money”? Feel free to read the full answer on the website yourself, but my intention is to remind you once again not to invest more than you can afford to lose, no matter how much the risk-free aspect is emphasized. The website is a well done HYIP standard – easy to browse, sign up, calculate profit and make a deposit. However, note that a deposit is added to the user account after 3 confirmations over the blockchain network, so it can take a little while. The legend of the programs again is simple emphasizing the cryptocurrency investment aspect instead of the team. The admins call themselves an experienced team of institutional grade cryptocurrency trades. On the About us page admins share a few sentences about team’ s three departments and how they follow the highest standards of honesty, truthfulness and responsibility. And that’s about it. Nevertheless, I appreciate that they haven’t added a bunch of fake team photos. Yet they have worked on FAQ page, covering almost everything that’s important to protentional investors (account, investments, withdrawal, affiliate program questions). Sometimes an approach like this helps to stand out a lot better. If some of you are not particularly against the offered investment term, initial deposit returned at the end of the investment term, or any other aspect this program is offering, then I would say that Coinfinance Ltd looks like a fine cryptocurrency inspired program. Admins call the program “Your bridge to the future money”. To a certain degree, I would actually agree to the concept of this marketing slogan, because the offer in combination with the job that admins have done, could really serve someone as a bridge to the HYIP world. What do you think about Blue Spot Ltd so far? Share your thought in the chat box below! As always lets take a look at the Alexa rank. Of course, Alexa rank must be perceived only as a hint. Currently, the main Coinfinance Ltd audience comes from Brazil, India, Algeria, Russia and Egypt. 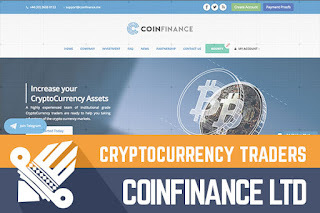 Despite the fact that Coinfinance Ltd also has Twitter and Facebook profiles, it not possible to make any assumptions about the main audience, because both of the profiles have been quit since the first post on September 3, 2018. However, programs’ Facebook already has more that 10 000 followers on Facebook. So, you can guess what this means! The website has a valid SSL certificate assigned by GeoTrust EV RSA CA valid until August 27, 2019. In addition, the admins have added the certificate of incorporation on the website to add extra credibility. A company named Coinfinance Ltd has been incorporated on July 3, 2018. What does the Internet say about our rival? For now, them main discussion is focusing around the investment offer – the interest rate, investment term and deposit. However, it seems that people accept the offer, some share their investment and withdrawal data. However, nothing unusual for now. So, let's get to the most important part – the investment opportunities. An investment calculator is available on the website. However here I will focus on the most affordable investment plan. The first plan, that offers 3% daily for 70 business days. An investment of $200 it would generate a daily return of $6. With 3% daily for 70 business days, the break-even point is reached after 34 business days. However, keep in mid that it will take approx. one and a half month including the weekends. And at the end of the investment term (70 business days or 98 days including weekends), a $200 investment would have made a net profit of $220 and $420 in total in case the program will last 70 busines days after the investment and the initial deposit is returned. Of course, the program also offers a referral program. As usual, to participate in the program user doesn’t have to make investments. Today we are looking at a two week old cryptocurrency inspired program. Coinfinance Ltd offers mid-term plans that would attract potential investors with the offered interest rates. Today the program looks totally fine yet again it’s impossible to predict the potential lifetime of it - how good the admins will manage to reduce the risks of stopping paying before the 70 business day period. Therefore, if you ever decide to make any investments, don’t invest more than you can afford to lose! 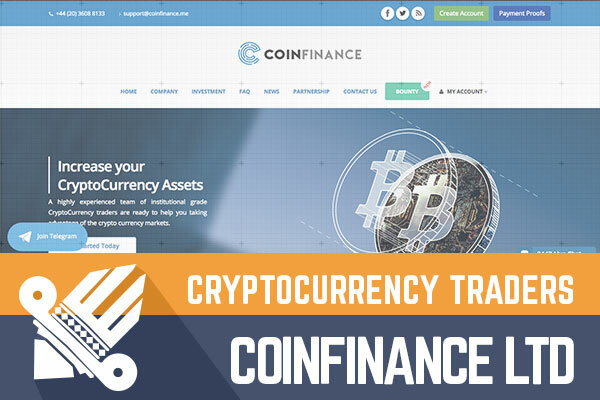 Have you already made an investment in Coinfinance Ltd is and have any useful information to share with us? Please drop a message in the chat box to share your experience! Investment plans: 3% up to 5% daily for 70 business days. Initial deposit returned at the end of the investment period. Payment processors: Bitcoin, Ethereum, Bitcoin Cash, LiteCoin, DogeCoin, and Dash.